A new and fresh adventure is about to ‘take off’ on the shores of Nayarit! 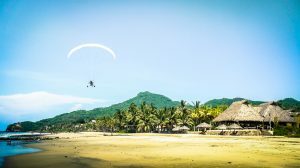 Big BLU Expeditions can show you the magnificent vistas from their tandem trike paramotor, giving you a breathtaking bird’s eye view of Punta de Mita and Litibu, located on the North Shore. Once comfortably seated in the front, (assuring you the best view) their certified pilot will get the wing up in the air and glide easily along the beach for a brief take off run. Before you know it, you are floating over the beach and ocean! It is truly breathtaking to see the waves start their journey to the beach from the sky… What you can’t see easily from the beach, you can see with such clarity from above. Your adventure starts from Big BLU Expedition’s office, situated on the highway between Punta de Mita and Sayulita, in the tranquil town of Higuera Blanca. You can’t miss their bright blue office alongside the road, only meters away from the arched entry into Higuera Blanca. The owners of this new venture are Alfonso Estrada and Kim Kuzma. Alfonso (creator and founder of the original Ocean Grill restaurant) is the man with an exquisite vision for his magnificent restaurant, Litibu Grill, nestled against the vast beach. Kim is known for her many years of performing in Vallarta but was also one of the guests on HGTV‘s House Hunters International along with real estate agent Taniel Chemsian her dear friend, Phil Lobel who purchased a magnificent home here in Vallarta. Alfonso started flying 29 years ago with hang gliders and paragliders, then moved to paramotors two years ago. After flying solo in front of his restaurant over the years, many guests would ask if he could take them up to do the same . 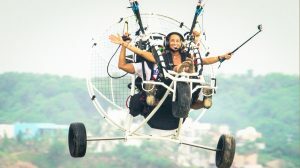 It seemed a logical step to move to a tandem paramotor in order to do so, sharing his love of flight with others! Kim’s immense love of adventure and networking, along with their friendship, brought them together for this joint venture. They look forward to taking you to new heights! Call ahead to book your flight!